Priceline’s Name Your Own Price hotel bidding tool is definitely the best way to get the cheapest hotel rates possible in an area. How it works is: You pick an area and star rating you like and then put in a price that you would be comfortable paying. If the price is greater or equal to what the hotel will accept then you’ve succesfully booked a room. If your price is too low your bid will be rejected. There are a few caveats when attempting to bid for hotel rooms. There is absolutely no way to be sure what hotel you will get. Unlike Priceline Express deals which can be identified with near 100% certainty. You have to “Guess” the lowest price the hotel will accept. If you guess too low you might be locked out of bidding again for another day. Or if you guess too high then you are overpaying for a hotel. For the last point there is a way to get around being locked out of bidding for 24 hours. Priceline will let you bid again if you select an additional area to bid on. Now the trick is to select another area that does not have any hotels in the star rating you selected that way you can bid again but will still only be able to get hotels in the original area you selected. 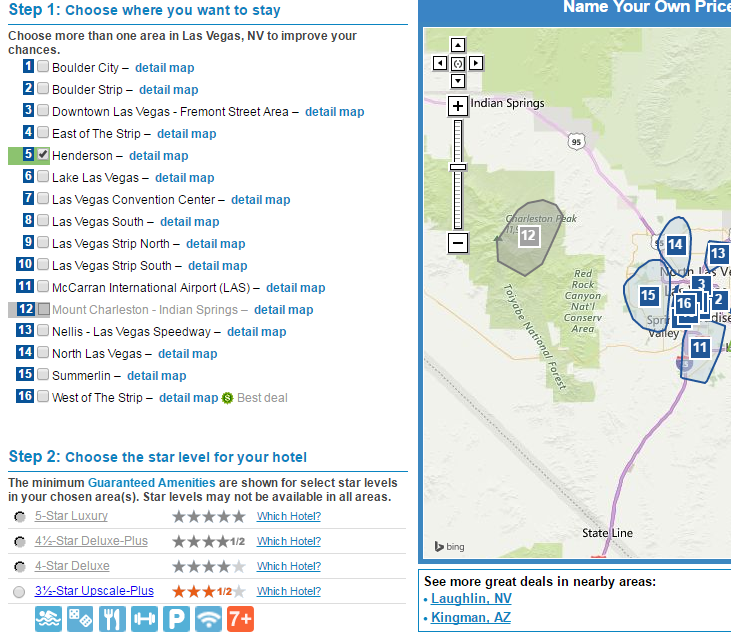 In the above image you can see that I am trying to book a 5-star hotel in the Las Vegas Strip North area. 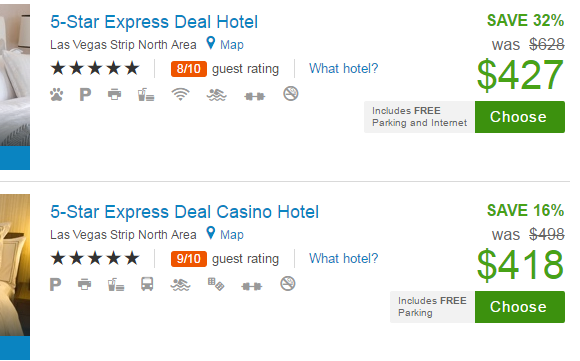 The free re-bid trick works best with the highest star rating hotels. 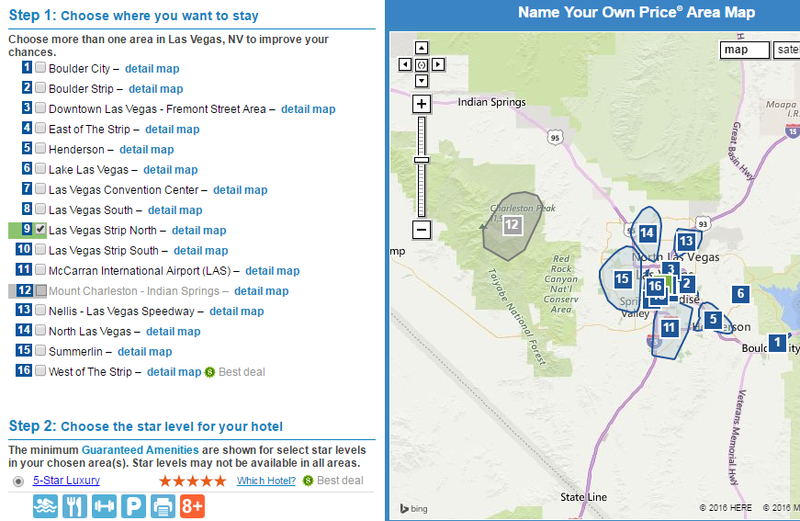 Priceline guarantees you will get a hotel that has at least the star rating you select. You can get a hotel with a star rating higher than what you pick so you might as well pick the highest to try bidding on first (you can always pick a lower star rating hotel later to keep bidding). One of the areas and star rating’s will have a little “Best Deal” Next to it. Priceline claims you can save up to 60% off retail rates when you are bidding for hotels. Although, some people claim to have saved an even higher percentage. The “Best Deal” means the bid acceptance price is closer to that 60% savings than any of the other options. You should keep that in mind when you pick a price to start your bidding. The first bid you make should fail. It should be a price you are 99% certain is too low for the hotel to accept, because occasionally it isn’t. If your first bid is accepted then that means you probably could have gone with a lower price. The goal for bidding is to start low and then gradually increase the price by small amounts until your bid is accepted. Then you know you are overpaying by no more than the margin between your bids. The other, is what the same hotels are going for on Priceline Express deals. With this information I would be 90% certain the minimum bid price is between %60 of the retail rate and the cheapest Priceline Express rate, or $599 * 0.60 = $359 and $418. I would normally start my bid around $359, but since there are many opportunities to re-bid in Las Vegas I might start lower, say $250 or $300. Different areas with less re-bid potential might have to be handled more conservatively. Once your first bid is rejected it’s time to do the free re-bid trick by adding another area to your bidding that you know doesn’t have any 5-star hotels. To know an area doesn’t have any 5-star hotels you need to have selected ONLY the area you are investigating for possible 5-star hotels. I know that Henderson doesn’t have any 5-star hotels after selecting only Henderson and seeing that the 5-star option is grayed out below. It is safe to select Henderson and Las Vegas Strip North together and bid again for a 5-star hotel knowing you can only get a hotel located in Las Vegas Strip North. For your rebid you should increase your price. The amount you increase is up to you, choose whatever amount you would feel comfortable overpaying for a hotel. I wouldn’t have any guilt from paying an extra $20 to stay at a 5-star hotel in Las Vegas so I’d increase the bid by $20 and try again. Keep repeating this process by finding new areas without any 5-star hotels and increasing your bid price gradually. Eventually you will win the bid, or the price will become too high to be worth paying. If your bids are getting close to $418 you might as well go the Priceline Express route since then you are guaranteed to get a decent price and are very likely to be able to identify the hotel. Remember it’s very easy to look up the identity of Priceline Express hotels on the easy to use Priceline hotel List tool.